Luvisi’s was an upscale Italian restaurant on 5th Street here in Louisville, near Walnut, now named Muhammed Ali Blvd. The building no longer stands, long ago torn down and replaced by a park, providing a domicile for the homeless. It was right next to the Lincoln Garage, now an office building, and an edifice with a peripheral appearance in my life with pizza, which I’ll get to soon enough. My parents, brother and I rarely went out to dinner, but when we did, it was usually to Luvisi’s. Which had a neon sign over the entrance, with the words “pizza pie” on the bottom. I thought it was some sort of dessert. And am pretty sure I never ate it there. Though I became forever proud and further connected when the Luvisi’s son, Lee, became an internationally renowned classical pianist. I feel certain my first taste of pizza must have been when I was still a pre-teen, at Calendrino’s, which opened in a tiny space on Bardstown Road near Bonnycastle, around the corner from where we lived. The guy would make the pies in the window, tossing the dough with a flourish. Being both fascinated with the technique and an inveterate husko gordo, I became a regular. It was around that time, I spent a summer at Camp Day-Cho-Lah on Green Lake in Wisconsin. One night a week, we’d head to town for a movie. Afterward, I’d be hanging in the bakery, where, at night, the fellow made pizzas, before the town had its own stand alone pizzeria. And that Lincoln Garage connection I mentioned above now comes into play. The default pizzeria of my life, starting in junior high school, was Lentini’s. Whose proprietor was Sonny Lentini. He earned his chops while managing Mario’s, another pizza place long gone, but once had a location among others in Saint Matthews, about where Lotsa Pasta now stands. My family knew Sonny because his dad Tony parked cars at the Lincoln Garage. Where we parked when we went to U of L basketball games at the Jefferson County Armory, later Louisville Gardens, later a white elephant awaiting a benefactor and renovation into something useful. Sausage. Green peppers. Onions. Later mushrooms got added to the mix. That’s my combo. At least when ordering a heftier, ingredient-laden pie. Though, when going for a NY style slice, I eat it the way Tony Manero, Paulie Walnuts, Mario Lanza, Gina Lollabrigada and Federico Fellini eat it. The regular way. Thin. Thin crust. Thin layers of tomato sauce, cheese with a sprinkle of spices now and again, one of which, by law I suppose, must be oregano. It would not be a deception to say I was obsessed with pizza. But nothing like Colin Atrophy Hagendorf, whose odd middle name has some origins in a former life as a punk rocker. 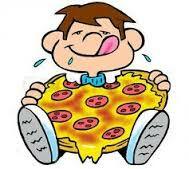 In August, 2009, Hagendorf, the pizza lover supreme, decided to eat a slice of pizza at every . . . single . . . pizzeria . . . in . . . Manhattan. Always a “regular slice,” though he blanches at the use of thate term. Because, when referring to a NY slice, a slice is a slice. Dough. Tomato sauce. Cheese. Spice. No aberrations like additional pepperoni or sausage or veggies. Or, gluten free or whole wheat crust. Colin, you are my new hero. Having listened to a podcast with Hagendorf, and reading a bit about his journey, I, of course, wondered if I could do this here in Louisville. Out of respect and as homage to He Who Had Gone Before. But, it wouldn’t be so simple. Because, frankly, when it comes to pizza, Louisville is not a slice kind of town. Sure, there are a few places where you can get a big old slice, one that drips with grease and needs to be folded. But the baseline here in the Heartland is a whole pie. With additional substance melted thereupon. Often, as in the case of Benny Impellizzeri’s transcendent pie, in abundance. So, I’ve set the idea aside. Though I now realize, I’ve gotten into sort of a rut. There are a couple places I like. Plenty more that I haven’t tried. It’s about time I do. New York has a lot of pizza plaecs. A LOT of pizza plaecs. Which means that some of them don’t live up to the reputation of New York pizza. Joe’s Pizza doesn’t have that problem. They serve up the near-perfect New York Pizza slice. An excellent representation of the reputation.A great grab and go slice at just about any hour.Their crust is thin with a great crispy-ness on the outside and nice chewy-ness on the inside. The sauce is just flat out tasty, and the cheese is also just right: A little salty but never overwhelming to the point where it pulls off the slice or drips on you.Highly recommend the Fresh Mozzarella slice. A little more money, but well worth the experience.I’ll grab a slice or two anytime I’m anywhere near this spot. Don’t miss out! 1. I do remember going to Lentini’s after the seminal Bob Dylan concert in the mid 60s, on the first tour when he went electric. I had a first date, who, while we were sharing a large pie with friends after the show, admitted she simply didn’t like Dylan very much. Why ever would I take a date, especially one who didn’t understand how important Dylan was? Answer: It was the 60s. Going out at night without a date was socially unacceptable.